A prior history of TB is present in approximately 50% of children with TB meningitis. 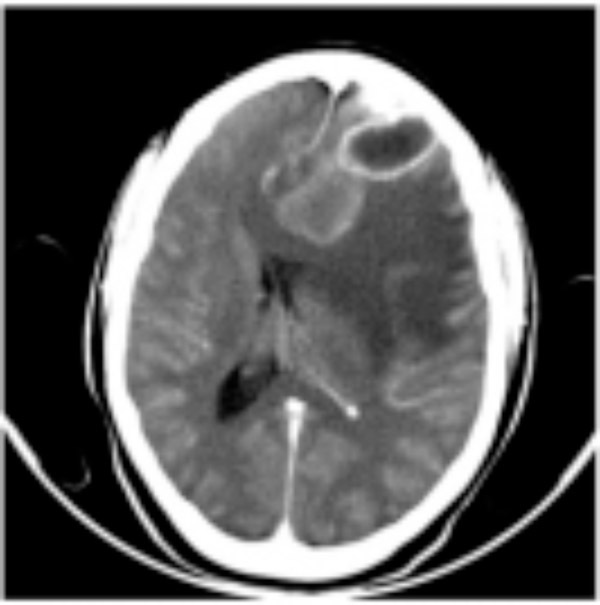 Intracranial TB will be associated with encephalopathy, vasculopathy, space-occupying lesions in the CNS (single or multiple tuberculomas and/or TB abscesses), and TB meningitis. Seizures, either focal or generalized, may occur during acute illness or months after treatment. Terminal illness is characterized by deep coma, decerebrate or decorticate rigidity, and spasm. Somatic: Low-grade fever and headache (for more than 14 days) along with meningeal signs and elevated ICP features such as vomiting and altered sensorium should raise suspicion of CNS TB. Bulging fontanels develop in infants, who become increasingly irritable. Ophthalmoscopy examination can reveal papilledema and choroid tubercles (yellow lesions with indistinct borders either singly or in clusters). Cranial neuropathies: Cranial nerve palsies, most commonly the sixth nerve, occur in 20–30% of patients and may be the presenting manifestation of TB meningitis. Vision loss due to optic nerve involvement secondary to optochiasmatic arachnoiditis, third ventricular compression of optic chiasm (if hydrocephalus develops), optic nerve granuloma, and ethambutol toxicity are possible factors for vision loss in these patients. Motor: Hemiplegia may occur at the onset of the disease or at a later stage. Quadriplegia secondary to bilateral infarction or severe cerebral edema is less common and occurs only at an advanced stage in a few patients. Choreiform or hemiballistic movements, athetosis, generalized tremors, myoclonic jerks, and ataxia have been observed, more commonly in children than in adults. Tubercle bacilli – definitive diagnosis: TB meningitis depends on the detection of tubercle bacilli in the CSF, either by smear examination or by bacterial culture. AFB smears are reported within 24 hours, while cultures require typically 6–8 weeks. Rates of CSF culture positivity for clinically diagnosed cases range from 25–70% (17). Beyond the diagnostic value of these methods, the importance of obtaining a culture is that growth of M. tuberculosis in culture allows drug sensitivity testing, which can have a large impact on appropriate drug selection and prognosis. Despite its importance among the diagnostic methods used for CNS TB, traditional staining and culture remain relatively insensitive, most likely due to the typical paucity of AFB in a clinical case of CNS TB. Techniques to improve the sensitivity of AFB staining in the CSF include staining the clot that forms in standing CSF and spinning down the CSF sediment onto a slide for microscopic examination. This approach produced 91% sensitivity in 100 consecutive cases (28). Staining multiple samples of CSF enhanced the sensitivity to 86% (29). Samples from cisternal and ventricular CSF appear to have a higher culture sensitivity than conventional (lumbar puncture) CSF samples (30). A recent study established that both CSF volume and duration of the microscopic evaluation are independently associated with bacteriological confirmation of CNS TB, suggesting that a minimum of 6 ml of CSF fluid should be examined microscopically for a period of 30 min (31). CSF profile: Pleocytosis (more than 20 cells, more than 60% lymphocytes) with increased proteins (more than 100 mg/dl) and low glucose (less than 60% of corresponding blood glucose) are seen. Molecular and biochemical analysis: Commercially available nucleic acid amplification (NAA) methods and other PCR-based methods, antibody detection, antigen detection, and chemical assays such as adenosine deaminase (ADA) and tuberculostearic acid measurements should be included (17). The bromine partition test can be successfully used to differentiate cases of proven TB meningitis from patients with aseptic and non-TB meningitis (32). Chest x-ray: 50% of patients with TB meningitis have chest X-rays suggesting active or previous pulmonary tuberculosis. Miliary disease on chest x-ray: 10% of chest x-rays show miliary disease, which is strongly associated with CNS involvement. 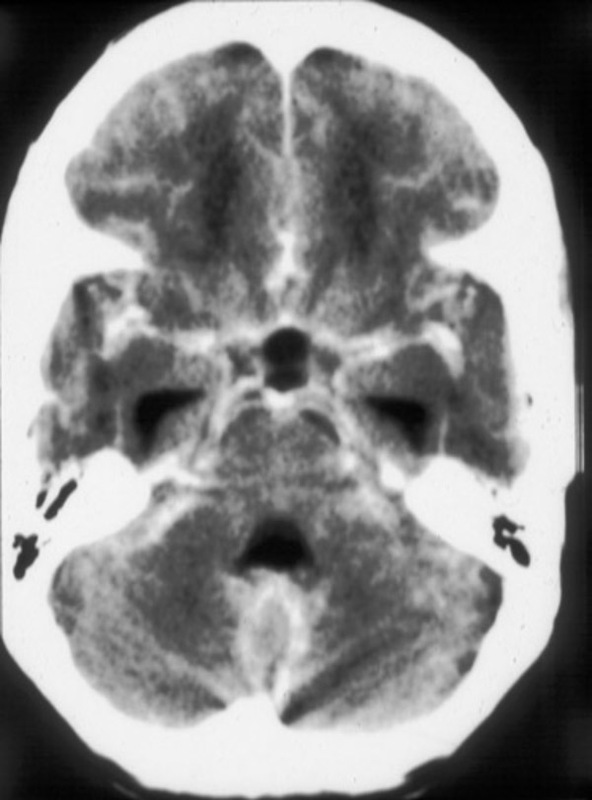 CT scan of TB abscess: Left frontal lobe TB abscess and cerebritis with extensive surrounding edema. Choroid plexus enhancement: Ventricular enlargement with enhancing choroid plexus on imaging is highly suggestive of TB meningitis (33). Exudates in basal cisterns or in sylvian fissure: Basilar enhancement is associated with a poorer prognosis and with an increase in the incidence of basal ganglia infarction (33). CT cisternogram of TB basilar meningitis: Note diffuse enhancemnt of cisternal spaces. Hydrocephalus: Initial studies with air encephalography in patients with TB meningitis found hydrocephalus in 62% of the patients and found CT evidence of hydrocephalus in 83% of 193 children with TB meningitis (34, 35). In a CT study, only three of 60 children and adults with TB meningitis were found to have normal ventricles, giving an incidence of 95% (33). Significantly, 87% of children in this study had severe hydrocephalus. Compared to an incidence of 71% in children, only 12% of adults with TB meningitis had hydrocephalus. Thus, it is evident that hydrocephalus is more common in children with TB meningitis than it is in adults. Hydrocephalus is also more common in the later stages of the disease (25). 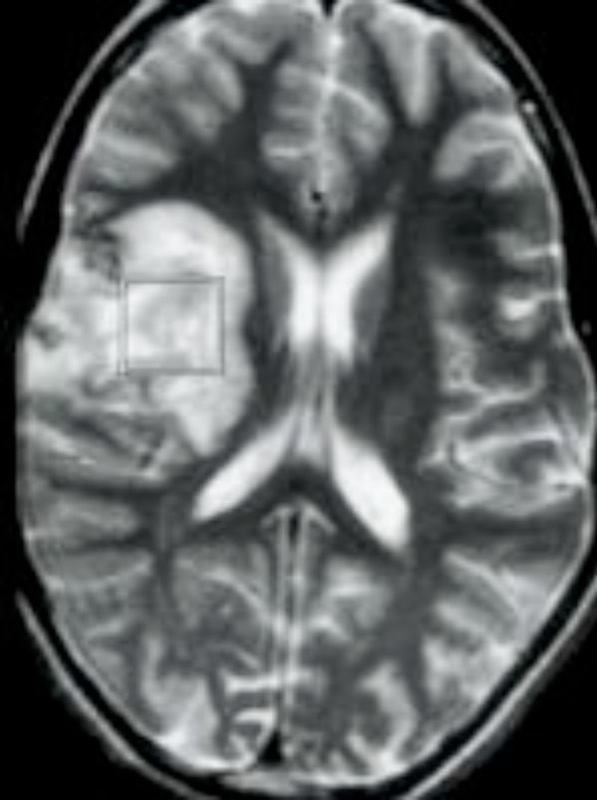 Infarcts: Infarcts in the basal ganglia can be seen with TB meningitis. Combination of hydrocephalus, basal enhancement, and infarction: This combination was 100% specific and 41% sensitive for the diagnosis of childhood TB meningitis in one series (36). Meningeal enhancement: Diffuse, thick, meningeal/gyral enhancement can be seen on MRI. Cerebral infarcts: These can be present, particularly in the basal ganglia. Large lipid, lactate peak on MR spectroscopy: This is specific for identifying tuberculomas by MR spectroscopy (37). Tuberculoma formation: Tuberculomas are usually isointense relative to gray matter on both T1- and T2-weighted images and appear as conglomerated ring-enhancing masses on gadolinium-enhanced T1-weighted images (38). 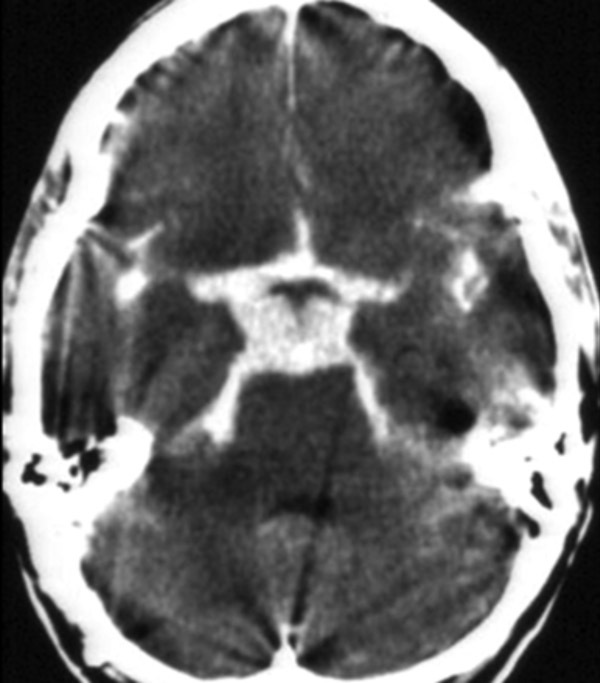 Intracranial TB: Encephalopathy, vasculopathy, space-occupying lesions (tuberculoma, abscess), TB meningitis, and tuberculomas (single or multiple) with miliary tuberculosis. Vertebral body TB: Bone marrow edema and enhancement, posterior element involvement, canal stenosis, and spinal cord or nerve root compression are often seen. Intervertebral disk enhancement, vertebral collapse, and kyphosis deformity are particularly suggestive of tuberculosis. Pott’s spine and Pott’s paraplegia, and nonosseous tuberculomas are other manifestations of spinal tuberculosis. The thoracic spine is most commonly affected. 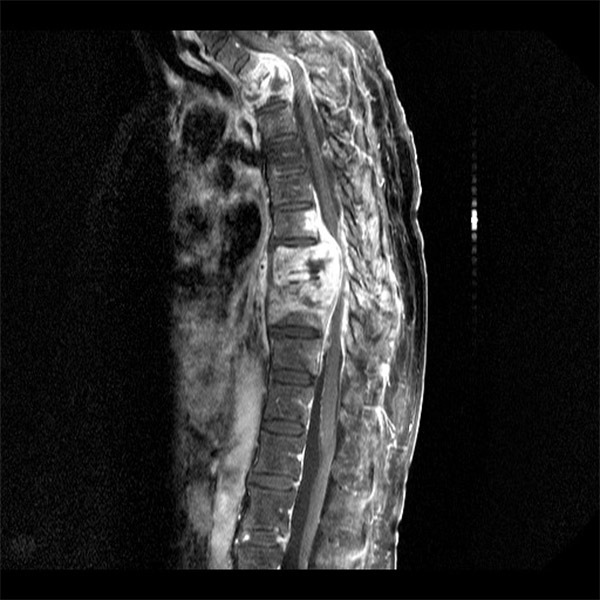 T1-weighted MRI with gadolinium of tuberculoma in the spinal column: Present are vertebral collapse, kyphosis, and canal stenosis at two levels, all due to tuberculomas, whose epicenters are in an intervertebral space of the upper and mid-thoracic spine. Labeled leukocytes for source identification: Gallium-67 citrate, Indium-111–labeled autologous leukocyte (WBC) scintigraphy, and fluorodeoxyglucose (FDG) positron emission tomography (PET) are useful in the setting of pyrexia of unknown origin in which TB is implicated and no definitive source has been identified with other imaging techniques. PET scans may be useful for monitoring responses to anti-TB therapy in patients with tuberculomas (40). PET CT to evaluate vasculitis: Single photon emission CT scanning with hexamethylpropyleneamine oxime (HMPAO) can be used to assess the degree and extent of cerebral ischemia resulting from TB meningitis and cerebral vasculitis. Findings are specific only for diminished cerebral perfusion. Radioisotope shunt study for patency: CSF shunt imaging with 99mTc-diethylenetriaminepentaacetic acid (99mTc-DTPA) can be done to determine whether the shunt is patent and to exclude shunt obstruction. Therapy based on clinical suspicion: Delayed treatment of CNS TB is strongly associated with death and neurological sequelae. Many patients with radiological suspicion of CNS TB require empirical therapy, especially in endemic areas. Every patient with TB meningitis should preferably be evaluated with contrast- enhanced CT imaging before the start or within the first 48 hours of treatment (26). Mycobacterial culture results may give additional information, but culture is not sufﬁciently sensitive to rule out TB and should not inﬂuence treatment decisions if the prior probability of CNS TB is high. The low sensitivity of all currently available rapid diagnostic tests means that empirical therapy may need to be started in many patients with suspected CNS tuberculosis (17). Therapy continues until alternative diagnosis confirmed: Therapeutic response (either lack of response or rapid recovery) should not be used to determine when to stop treatment. The safest approach is to give a complete course of treatment to all patients given empirical therapy unless an alternative diagnosis is made (26).